✅ Trip Verified | Thanks to an exceptional deal to the Caribbean I had the chance to fly Corsair, a french-based leisure airline. Coming from a neighbouring country I had no clue what to expect and planned on being on a typical holiday flight with minimal service. I was more than pleasantly surprised and had a very enjoyable flight to the Caribbean and back. Check-ins in Orly and Fort-de-France were a breeze, staff on the airline very attentive and full of smiles. Perhaps thanks to the very civilized french holiday crowd the flights were relaxed and quiet. And we were treated with a full meal and drinks of choice (including decent french wine) and snacks before landing. All in all, an outstanding flight experience, which I will gladly repeat at any given time. Highly recommended! ✅ Trip Verified | Paris to Pointe a Pitre. Cabin very densified. I chose duo seat for more space. Standard seating comfort but rather quickly uncomfortable. The cabin, dating from 2012, is aging rather well. IFE: old generation and not at all reactive. The touch works with the nail but you have to be patient as the reactivity is bad. The catering is just ok. The quantities are minimalist, even for the eco, the taste is correct when the search for originality is totally absent. The snack (2 brownies) before arrival is a petty joke. FR: Cabine très densifiée. J'ai choisi siège en duo pour plus d'espace. Confort d'assise standard mais assez rapidement inconfortable. La cabine, datant de 2012, vieillit plutot bien. IFE: d'ancienne génération et pas du tout réactif. Le tactile fonctionne avec l'ongle .. mais il faut être patient tant la réactivité est mauvaise. Le catering est tout juste correct. Les quantités sont minimalistes, meme pour de l'éco, le goût est correct quand la recherche d'originalité est totalement absente. La collation (2 brownies) avant arrivée est une blague bien mesquine. 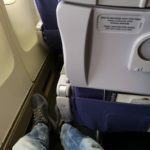 "airline is value for money"
Not Verified | Old Boeing 747 aircraft, but clean and enough legroom. Entertainment is very average, but this airline is value for money - what you pay is what you get. I paid round trip 11 hours flight to the amazing island of Reunion 630$, its very good price and cannot complain. Corsair offer solid product, the food is bad on board, but many airlines that offer higher rates, serve bad food as well. Clean plane, good and friendly service and offer enough drink during the flight include wine. "Avoid this airline at all cost"
✅ Trip Verified | Paris to Réunion via Mauritius. If you are not French or you don’t speak the language you’re in for a really nice surprise. Nobody in no position will know more than 2-3 words that barely make sense. Somebody was feeling sick so we had to make a forced stop in Rome. I had no idea what was going on. Needed a lot of power of deduction when trying to speak to a flight attendant to understand what was going on. They said we were to get off to refuel just to keep us on the plane for 1 more hour so that we find out that we were not going to proceed to our destination but surprise go back to Paris where nobody knows anything and again nobody bothers with English. We were sent to a hotel after a long wait and cold shoulder treatment (in French of course) after being ping ponged around between check in and their desk where nobody knows when the flight is or what’s about to happen. They put out another announcement and guess what only language they used saying to meet outside for the bus (lucky for me I was one little bit attentive in my French class in high school). One lady at their counter said and I quote “we don’t know probably at the beginning of night “ referring to the flight to take us to our destination. How are they going to give me my days of holiday back when they can’t even point me in the right direction for the mysterious hotel. Avoid this airline at all cost! ✅ Verified Review | Montreal to Paris. Not what I expected and paid for. I have been flying with Corsair almost every summer for the last few years in Grand Large. I was appreciating the extra space at a price similar to Air Canada full fare economy class, and Orly and not Roissy arrival (more convenient for me ), A1 passage at Orly with the lounge. Surprise: during the last trip, no light purple seats. It was full flat bed but not working properly. Surprise: the crew did not speak french, barely English but Portuguese, and service was almost non existent. They dont work for Corsair, they work for Hi Fly - an unknown Portuguese charter line based in Malta. There was a few real Corsair employees on board but not enough. The turbulences were bad that day and I was crossing my fingers that the pilots were more competent than the stewardesses and that the plane was in working order. As the interior was more East Asia style than european, I did my little research and it was an old plane for SriLankan Airlines. The food was good in Grand Large. The entertainment system was a joke: less than 10 movies. Lucky us we had some on our I Pads (loaded for a Rouge flight). Probably the last time I fly with them. 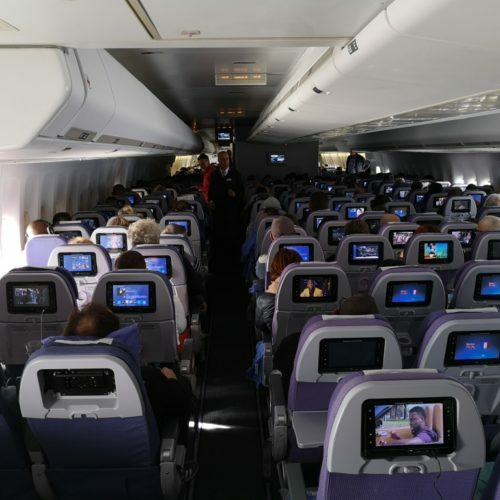 They are reconfiguring their Grand Large for a real business class with beds, decreasing in half the number of seats and likely doubling their prices. Note: for those flying to Orly, massive construction until 2019 (linking Orly Sud and Orly West) with a lot of gates missing and plane transfer by buses. 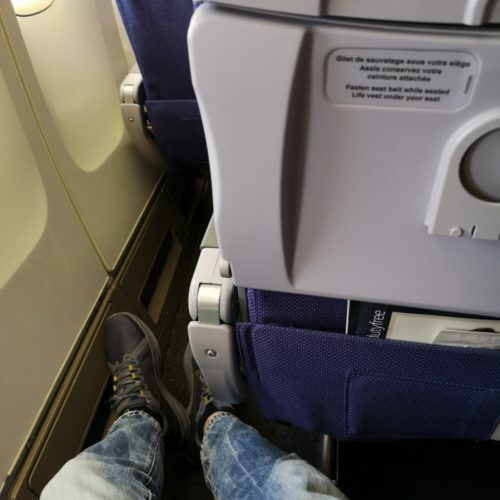 "end up on a charter plane"
✅ Verified Review | I paid and book several months in advance a flight with the company Corsair and to my disappointment I end up on a charter plane of a Portuguese company flying from Montreal to Paris. Why pay for Corsair flight at a full price to end up on a foreign charter plane. Entertainment onboard only has old movies that I have seen in flight on other routes several years ago. No relation with the one that is posted on the Corsair site. Moreover the French leaves a lot to be desired on board. My mother tongue being French I myself had difficulty understanding. I call this stealing customers and this is the last time I would travel with Corsair. Pay the price for Corsair and finish with a charter company called Hi Fly, no thanks. "getting worse year after year"
✅ Verified Review | Reunion to Paris. Corsair's service is getting worse year after year. Whether it be communication or service. Much of the information provided on the website is inaccurate. The company boasts daily 7am-10pm hotline for frequent users, I called at 8.30 only to hear a message saying they were closed. I sent messages on social networks and never got a decent reply, let alone help. I need to buy more luggage for my trip, the webste announces a total 9 pieces allowed, and the opportunity to book up to 4 from the website, but you actually can book only 2. Onboard the meal was honestly the worst ever (they never are very good in aircrafts but that one was inedible). I even advised a friend who was flying with them a few days later to bring his own meal and am planning to do the same for my return flight. I've been flying to France about 2 or 3 times a year for 10 years and never had such a bad meal before. The tactile screen was old, scratched, and not very reactive, which led the person behind me to push the buttons quite fiercely - it moved my seat and prevented me from sleeping since the screen is attached to the seat in front of you. And while leaving the aircraft, a hostess physically pushed my friend instead of asking him to use the path where she required him to go. "first and last time flying with them"
Montreal to Paris Orly. Corsair postponed my evening flight to the next morning. They refunded me 17$ Canadian, saying they only refund expenses incurred before the flight. I asked their customer service to direct me to their policy which I didn't see on their website nor on my boarding pass/booking confirmation, and they stopped responding to me. I live in Canada, and their call centre hours, 9 am to noon France time, make it impossible for me to call them. First and last time flying with them. Paris Orly to Saint-Denis, Reunion with Corsair. Very disappointing lounge at Orly Airport, poor food, only bread and cheese and nothing refilled. Plenty of champagne and wines etc. The worst was the very dirty carpets. This didn't look good for our first Corsair flight. The flight itself was excellent, with lovely food and drink and very attentive staff. Looking forward to return journey on 21st November. Very comfortable flight. 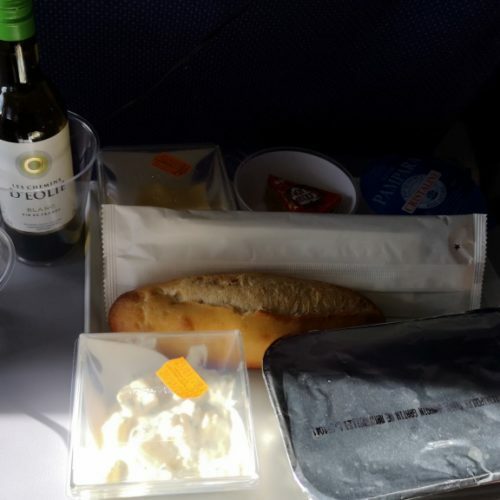 The flight departed in the evening and a full meal (bread, cheese, 2 warm dish options, desert, water) with complimentary wine (of good quality) was provided. Arrived early morning in Paris, before arrival breakfast was served. Also, additional beverages were distributed twice during the flight, after the meals. 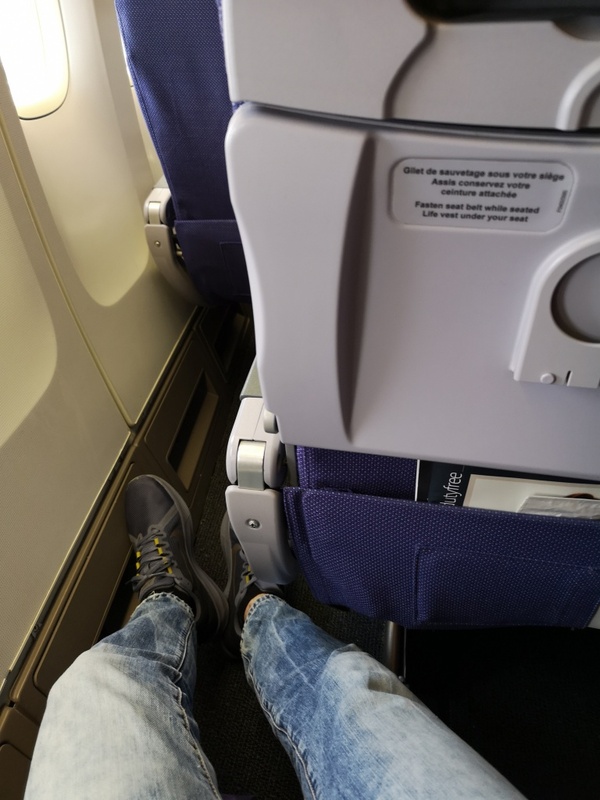 Kind and helpful staff, reasonable legroom and the option to select a seat for a small fee. Inflight entertainment was OK, but very French oriented (just like the messages from captain and crew, delivered in accented and rapid English) The airport at Point A Pitre only uses French for the announcements. Luggage delivery at Orly took quite a long time, but unclear whether the airline is to blame. Overall, a very comfortable economy class experience. If you don't understand French though, you might struggle a bit to understand the announcements etc.